This is a still-life nature drawing that took me a couple of weeks to complete. The hardest part was probably the amount of time and patience it took to get to the almost excrutiating degree of detail that I drew my composition in. In the end though, this is probably the piece that I am the happiest with, seeing as I'm almost never happy with what my art turns out to be. And one more thing: I NEVER thought I would ever say this in my entire life, but blind contour drawing helped more than I could ever imagine with this piece. Developing hand-eye coordination on a fine scale really helped with the extreamly detailed parts of the piece. At one point, some parts of this piece were straight up blind contour because of the amount of concentration it took to not lose my place, such as while I was drawing the pinecone. Practicing blind contour at the beginning of the year was extreamly helpful and I feel like I now have a better understanding of why it is stressed so much in art classrooms everywhere. This is a pair of jeans that I started at the beginning of the year, kind of forgot about, then finished about a week ago. I was inspired by the movie Coraline and the idea of the "other" people with their button eyes. That later evolved into the idea of people with button heads, which later evolved into the idea of button-demons crawling out of button-hell (unsuccessfully). My sister helped sew the buttons on and I drew little sharpie button-demons around them. This piece was designed so that the button-demons were almost interaction with the actual jeans and the fact that they are a pair of jeans. I managed this by having the button-demons grasping onto the denim and hanging from the pockets and the fly. This is very different from other things that I have done and I think was a unique experience for me. friend/creation of mine, a gift for my mother's birthday/Valentine's day. CARL is a clay turtle. CARL is NOT a ladybug, though the strange pattern on his back might suggest otherwise. CARL is a reptile, not an amphibian. The common misconception that turtles are amphibians upsets CARL and hurts CARL's feelings. CARL's eyes are the exact size of the back of a thumbtack, therefore if you stick CARL in the eyes with thumbtacks, CARL will become the ultimate turtle. Do not touch CARL anywhere near his eyes. CARL will bite you. Do not stare directly into CARL's eyes. CARL will stare into your soul. My oldest sister loves fashion and clothes. So what better to make her for Christmas than a tiny clay mannequin, right? Well, my plan was to cut Popsicle sticks in half and mold clay body parts around them so I could later piece them together into the full body mannequin. So I sat at our kitchen table for about 7 hours molding calves, thighs, forearms, and upper arms. About halfway through as they started to dry, they began to shrink around the Popsicle sticks and crack. I should have taken this as a warning that my project would fail miserable, but I was determined to make it work. So after I finished all the individual parts and made them look only temporarily presentable, I arranged them all neatly on a wooden tray to dry. It was picture perfect. 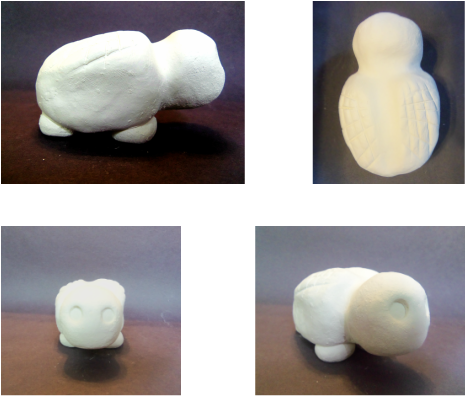 I had told myself to take a picture of it for my portfolio, because all the little clay parts looked really cool all lined up, but I was too lazy and said that I would just wait to take a picture of the final product. The thing I regret most was that it would have been THE perfect picture of my project. At that point, the parts were so well crafted that I had even designed the feet so the calves could stand on their own, each hand had five distinct fingers, and the torso even resembled a female one way and a male the other (weird, I know, but that's just the truth of it). The next day, they were miserably cracked, but I still stubbornly kept stuffing clay into the cracks hoping it would fix itself with some extra material. Christmas Eve night, I was hopelessly trying to assemble cracked clay body parts in a desperate attempt to give my sister a descent Christmas gift. I lost all four parts of the arms, one calf, one thigh, and the lower half of the torso. In the end, this is what I was able to manage: One complete clay leg, the upper half of a torso, and a clay block that would have been the base of the should-be mannequin. Early Christmas morning (as I had stayed up well past midnight to finish all of this and four other gifts), I found a nice cylindrical jar, stuffed the parts inside, and wrapped up the most depressing could-have-been gift for my sister. I guess if there is one important thing that I learned from this disheartening experience (and many more), it's that my though process/personal creative process is quite backwards. The average person would start with a small idea and build on it until they are satisfied with what they have created. I, on the other hand, normally get a brilliant idea that hits me in an instant, then as I think it through and modify it and really work though how I would accomplish it, it just slowly begins to crumble and devolve until I no longer have an idea. I end up disillusioned every time. I just hope that I can find some way to fix this, because I've lost a lot of great ideas to my, rather unfortunately, backwards creative process. Another acrylic painting and another gift for another sister. Frustration, disappointment, and probably some mild temper issues got the better of me on this one. I had originally used this canvas for the above "arrangement" before I decided that the sort of thing might not make the best Christmas gift. I had striven to paint a nice scene with some clouds and maybe a field of flowers or something like that. As you can see, that didn't really work out. But, hey! It made a killer present for my other sister, and now sits proudly in her room. This is another acrylic painting that I did a while ago for my sister's birthday. I just painted the whole canvas black then sort of improvised small detailed splatters in red all over. Unfortunately, the red paint ended up relatively thin where there wasn't enough of it, such as along the edges of the blotches. Next time I'll probably opt for some better paint or maybe just dry off my brush better (because that might have just been the issue). The picture on the right is a closeup of the splatter inception. When the red paint was half dry (still a little tacky) I took advantage of the thin, diagonally cut ends of my brushes and etched smaller splatters into the splatters, revealing a mixture of the underlying canvas and dry black paint. So far I've been enjoying working with acrylic paint, though it's taking some getting used to. It's a great medium for just regular painting and on-basis art whenever I feel like it. It's definitely revealed some things I could be working on regarding technique and I hope that the next one will be better. How I came to making this out of red, black, and a bit of gray, I don't really know. I kind of just sat down and smeared what was on my mind onto a piece of paper. So this is expression. I had never thought it to be this literal. It kind of scares me, my kind of expressionism. I like it, though. I had never really used oil pastels before when I made this. I quickly realized that they blend beautifully and decided to play with that in this piece. Honestly, I don't really know what it is. I guess that you could call it some weird form of abstract expressionism. I don't know what category it falls under. 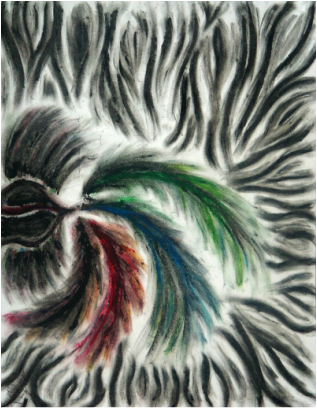 I really like the affect that the oil pastels give and I plan to use them sometime again soon.